Students received hands-on training in Solar PV from a variety of renewable energy experts, including Henry Red Cloud, owner of Lakota Solar Enterprises. At the end of July, Lakota Solar Enterprises (LSE) owner Henry Red Cloud had the honor of teaching a Solar Energy Workshop that brought Native Americans from around the country to the Red Cloud Renewable Energy Center on the Pine Ridge Reservation. The workshop explored basics of solar energy and culminated in a hands-on installation at the KILI Radio station, Voice of the Lakota Nation, where students expanded an already existing solar PV array. 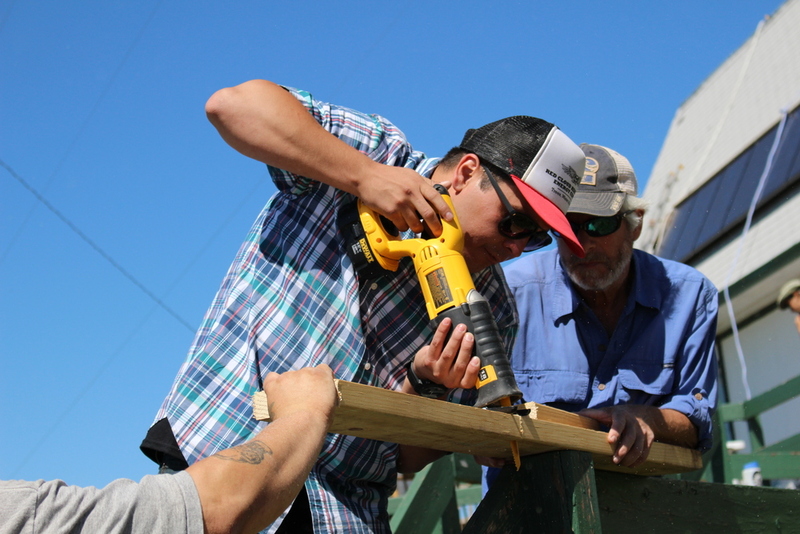 Trent Williams (left), a member of the Tule River Tribe, gains hands-on experience with installing solar energy with one the pioneers of the field, Johnny Weiss (right). On the Pine Ridge Reservation in South Dakota, home to the Oglala Lakota, over 40 percent of residents live without access to electricity. On Native American Reservations across the U.S., the Energy Information Administration estimates that 14 percent of households have no access to electricity, 10 times higher than the national average. Many tribes are looking to renewable energy as a way to provide reliable, clean energy to their tribal members. Jeff Tobe shares his extensive solar energy knowledge with student Hazen Lamere, a member of the Sisseton-Wahpeton Dakota Tribe. LSE works with environmental nonprofit Trees, Water & People to help facilitate this transition to clean, renewable energy on tribal lands. By teaching Native Americans about alternative energy, such as solar PV, we are fostering a new generation of Solar Warriors that will be at the forefront of the tribal energy sovereignty movement. Power to the people! To learn more about our work with Trees, Water & People please visit www.solarwarriors.org.